This 4-bedroom, 2-bath, private home offers a quiet oasis in an ideal location. In this home, not only will you find yourself a mere 100 feet from a beautiful, secluded beach, you will also be only minutes from the Village of La Jolla with myriad shops, galleries, restaurants, and an ocean front walk with amazing cilffside views of the Pacific Ocean. At the Childrens Pool, you can watch the seals bask in the sun on the beach, or you can walk a short distance north to see the sea lions frolicking in the water and on the rocks. Sea World, San Diego Zoo, Old Town, The Gaslamp District, and the airport are all within 15 miles. Nothing beats having a home that is close to the action, yet offers a quiet retreat to return to. 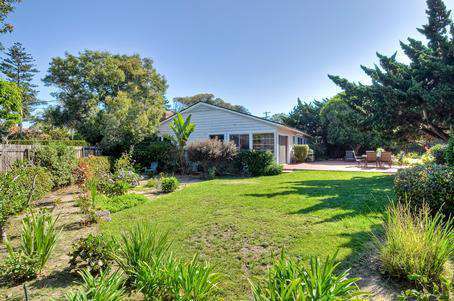 This house provides a completely private 2500 square foot back yard where you can relax and listen to the sounds of the ocean nearby. Read a book, take a nap, enjoy a glass of wine with friends, or have an outdoor barbecue. The possibilities are endless in this fully furnished, completely stocked, and pet friendly La Jolla Oasis. Large, Elegant La Jolla Gated Estate Home in an exclusive area with Pool, Spa, and Garden. A gated ,long ,private driveway leads you to the ultimate in privacy and luxury living. The home features a huge living room, elegant dining room ,private den and family room. There are 6 bedrooms and 4 and a half baths and the home can sleep up to 16 guests. The gorgeous kitchen has stainless steel Viking appliances and a long granite counter top with barstools. The large family room can be converted into a queen bedroom with queen sleeper couch. The master bath has a steam shower and whirlpool tub. Bedroom sleeping arrangements: Master bedroom: King bed….. Bedroom 2 near the pool: Queen bed… The Garden bedrooms all have full baths. The Kids wing has a queen and 2 twin beds; The maids' room has a single bed and a single trundle. The Grounds boast a separate grass patio yard with a new barbecue, pool and spa and beautiful pool furniture with lots of extra chairs. Also the the pool area is gated for the protection of your children. Come enjoy the beautiful San Diego weather in this exclusive private estate. 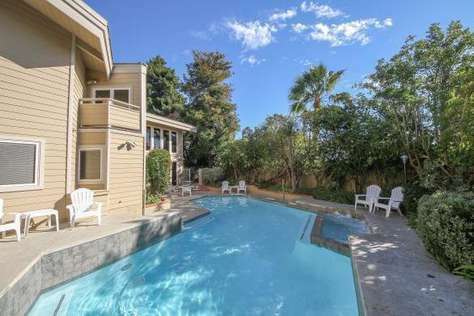 This La Jolla Home has air conditioning, wifi, a large heated pool and in the yard which is sunny in the afternoon. The large garden has outside dining and lots of outdoor furniture. including chaise lounges. This home is Close to all of the beaches of La Jolla and Pacific Beach . The kitchen has been recently remodeled with granite counter tops and stainless steel Cuisinart appliances. The bedrooms have a King in the master, king in the second bedroom, twins in third bedroom and queen sleeper in office/fourth bedroom.The bedrooms are nice and quiet. The living area is nicely furnished. The family and entertaining areas are another great feature of the home The large down stairs family room has a home theatre with VCR/DVR. Smart HDTV has Netflix. Just outside of the family room is the big heated pool and large spa that seats 8 to 10.